Sundays are not about "getting religion" for just one day a week, but about motivating, celebrating, and sustaining the spirituality we have and yearn to make stronger. We want to build a bridge between spiritual wisdom and the whole of the life we live. That's what our Sunday service is about at WellSprings. We look forward to seeing you some Sunday morning! 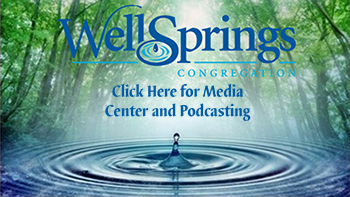 or subscribe to our podcast, "WellSprings Congregation" on iTunes! 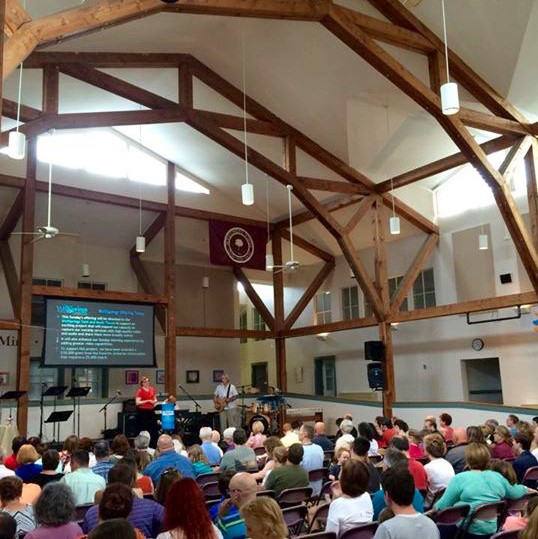 What can I expect at a Sunday Service? Sing Together. Our band plays music that sounds a lot like what you might listen to already. We look for songs from the past few decades that are spiritually-themed, or share a message that matches our values. Most are songs you might have on your playlist, or songs that play on the radio – a few are more traditional gospel songs, spirituals, or hymns. Lyrics are projected onto a screen so you can sing along! Greet One Another. Our Worship Leader is a member of the congregation, not an ordained minister. They’ll introduce themselves, invite someone to light a flame to begin the service, then share a story to help you get to know our community better. After that, you’ll have a chance to briefly greet the people around you. Feel free to let them know you’re new! You won’t be put on a special visitor list, asked to introduce yourself, or anything like that. Give Beyond Ourselves. WellSprings is a generous community, sharing what we have within and beyond our doors. Our Worship Leader will talk about what our giving supports, and you’ll have a chance to choose whether to contribute financially, or to sign up to volunteer on a Connection Card, as members of our community (often the kids!) pass the hats. There’s no pressure – especially for a first time visitor. Share the Silence. You’ll be invited into about a minute of silent meditation. It’s a peaceful moment that we hope will help to ground you, for the week ahead. Engage the Message. At this point in the service, children ages 5 and up are invited to join YouthSpirit, where they experience and discuss the things that make living meaningful. Adults, teens, and children who wish to stay with their families engage with a message delivered by one of our ministers. We aim to share messages that are heart-opening, thought-provoking, challenging, funny, and real. Our message closes with a prayer, led by the minister. Connect and Digest. Coffee and donuts are served as the service comes to an end with more music. There is a Welcome Table in the back corner of our space where you can pick up printed information, learn about ways to plug into a small group or Team, or just ask more questions about our community. Of course, you’re also invited to mill around, introduce yourself to someone new, or continue a conversation you began during our Greeting time! This Sunday Kathleen Higgins continues our new message series "Called to Be." In the months of March and April, as buds emerge from the ground and daylight hours grow, our preachers will explore the new aspects of WellSprings' "recharged" DNA - our mission, vision, beliefs, and commitments as a community. This Sunday, Kathleen will share a message rooted in both one of our "new" beliefs, "The Power of Community," and a "new" commitment, to "Work for Justice."